TOKYO -- Red-hot Subaru, gunning for a seventh year of record U.S. sales, is ramping up relief for supply-strapped dealers. 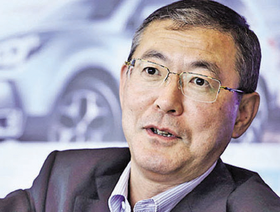 Yasuyuki Yoshinaga, president of Subaru-maker Fuji Heavy Industries Ltd., is boosting sorely needed production capacity in North America, the carmaker's biggest market, four years ahead of schedule. The new plan: Raise capacity at Subaru's Lafayette, Ind., plant to 394,000 vehicles by the end of 2016. Previously, Fuji Heavy had planned to lift capacity there to 328,000 by the end of next year and possibly to 400,000 in the fiscal year ending March 31, 2021, depending on sales. But booming sales demand more immediate action. "There are just not enough cars," Yoshinaga said. "If we only had more cars, we would be able to sell more." Yoshinaga unveiled the plan while announcing record revenue and profits in the fiscal year that ended March 31. He said he would brief U.S. retailers on the production expansion at a dealer meeting this week. He joked that he had been advised to wear a helmet to the gathering as protection against dealers clamoring for more cars. The Lafayette plant builds the Outback crossover and Legacy sedan. The Impreza small car will be added there next year when the capacity expansion begins. Subaru needs the added production at its only assembly plant outside Japan because of surging sales in North America, which accounts for 62 percent of its global volume. Yoshinaga said the company now expects North American sales of 600,000 units in the current fiscal year ending March 31, 2016. Just a year ago, the target was to sell that many in the U.S. and Canada in the fiscal year ending March 31, 2021. U.S.-only sales are forecast at 554,000 vehicles in the current fiscal year. North American sales rose 19 percent to 570,000 units in the just-ended fiscal year. Fuji Heavy predicted in January that U.S. sales would climb 5 percent to 540,000 in calendar 2015, for a seventh-straight record year.